V59 is recommended to all Predator users, as it addresses a flaw in the dive logging that can prevent dive logs from closing properly. This affected several of the previous versions, so all users are recommended to update. For rebreather controller models, the 0.19 setpoint is no longer automatically promoted up to the low setpoint when wet. In V56, a change was made to promote the 0.19 PPO2 setpoint up to the low setpoint (e.g. 0.7) whenever the wet contacts detected water. This change proved to be unpopular to the point that divers refused to update, so we have decided to remove this feature. The intent was to improve safety by preventing a diver from performing a surface swim with the setpoint at 0.19. As a reminder, the 0.19 setpoint is only for maintenance and storage, and should never be selected when breathing on the loop, even if just pre-breathing out of the water. As in all other versions, the 0.19 setpoint is automatically promoted to low setpoint when a dive begins. For rebreather controller models, a “SetP = .19” warning is shown on the main screen when the PPO2 setpoint is 0.19. 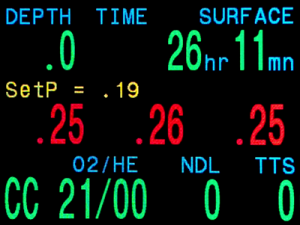 A yellow “SetP = .19” warning is displayed whenever the PPO2 setpoint is set to 0.19. This is to make it very obvious that the 0.19 setpoint is selected, as the 0.19 setpoint should never be used when breathing on the loop. See above. Fixed a problem that could cause the dive log to be closed incorrectly, preventing that log from appearing on the Predator or in the downloaded logs. Made changes to how non-volatile memory is updated during dive logging to improve long term reliability of the memory. I can’t upload the Predator upgrade. It can’t find the dive computer. I was able to download the logs but can’t upload the firmwear. V59 Assistance would be great. For the fastest service please drop us an email at our info address. We will forward it to Tech Support so Mark can assist you with your problem. When I try to download and open the new v59 predator firmware I keep getting a message that says window can’t open this file, and windows does not recognize this file. I am running windows 7. Please advise. David, please drop us a line at info@shearwater.com I will put you in touch with Mark and he will help you with this issue. The first Dive with V59 it’s all ok , 36m 92′. The best thing to do is to send us an email at info@shearwater.com From there I will put you in touch with tech support where one of our engineers will review and assist you. After upgrading firmware on my shearwater predator on JJ-CCR it is not possible to get a calibration. Calibration rund normal but calibrated value is not set to 0,98. It looks like computer holds old reading (0,94). Can your check software? Setting for calibration in computer is ,98…..
are you trying to calibrate in a high altitude location? My Predator shows the same behaviour when I calibrate in a higher altitude. Try calibrating at sea level or a low altitude location if possible. Hi, reason for low calibration was that cal setting was set to auto and it was really barometic low pressure that day. Received feedback from shearwater that cal settings should be set to sealvel at sea level, not auto. Hello there, cannot load new software onto my deep pursuit. I can down load log but Predator keeps on timing out. I say that as someone who saw Ghostbusters in the cinema, age five.